John McPartland, a senior policy advisor at the Chicago Federal Reserve, has just published an updated version of a paper titled “Recommendations for Equitable Allocation of Trades in High Frequency Trading Environments” . Some folks are probably wondering why an advisor at the Chicago Fed is getting involved in the HFT debate. Well, we have had the pleasure of meeting John McPartland and can tell you that he is a very astute market observer and he has some very creative ideas about fixing some of our market structure problems. Prior to his Chicago Fed days, John had a long history of working in the financial markets including being a settlement banker, trader and deputy manager of the Chicago Mercantile Exchange (CME) Clearing House. 3-Completely dark orders or the hidden portion of resting orders that are not fully displayed (lit) in the order book should go to the very end of the queue (within limit price) with respect to trade allocation. 6- Visibility into the order book should be no more granular than aggregate size at each price point. Market participants should not be able to view the size of individual orders or any other identifiers of any orders of others. 7- No market participant should be permitted to cancel an order before first obtaining an acknowledgement from the trading venue that the original order was received. “Dissemination of granular data from the order book allows algorithmic traders to gain inappropriate insights into the trading patterns of both algorithmic traders and click traders. 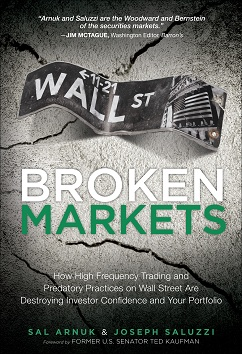 That said, we have no qualms about HFT firms using aggregated data from the order book: High frequency traders should continue to have the unfettered ability to attempt to reverse engineer aggregated data and reach any conclusions that they may care to reach. We agree with John and believe that the type of content that is being disseminated by the exchanges in the data feeds need to be reexamined by regulators. While the industry debates the advantages and disadvantages of speed, we believe that the content of the data feeds has been overlooked. To paraphrase a line from the Democratic strategist James Carville, “It’s the content, stupid”.